Sign messages are in place from Sunday to Sunday. The sign cost will vary depending on the amount and time you choose to advertise. The sign is booked on a first come, first served basis. Monthly advertisers will alternate spaces on the sign. You will have a difficult time finding less expensive advertising for a week! Click here for rate sheet. When joining the Chamber, members may signify whether they'd like to be a part of the 'Advantage Card Program.' We like to encourage our members to continue to do business and support other members. This is a small card given to members that offer other members discounts at their various places of business. For example, as a business, you may choose to offer other members a 10% discount. All Chamber members have the opportunity to have their brochures and business cards displayed in the Chamber lobby. These promotional items are available to all walk-ins and people who request information on the area. If you are already a chamber member, bring in your promotional information and we will put it out for you. This is a weekly publication in which member's events, sales, and notifications are sent out to the entire membership. The newsletter is sent out every Friday. This free advertising is only available to members. If you have any questions or submissions feel free to email info@dunelandchamber.org. You can also sponsor the Chamber Express on a weekly or monthly basis. The cost for one week of sponsorship is $40 and for a whole month is $150. Click here for rate sheet. The Chamber produces a membership directory annually. Directories are sent to every chamber member, given to all walk-in visitors, and distributed at the European Market. Advertising is only available to chamber members. Prices are according to the rate schedule. Call 926-5513 for details. Our quarterly magazine, Duneland Today is mailed to every household and business in the areas served by the Chamber: Beverly Shores, Burns Harbor, Chesterton, Dune Acres and Porter. Members receive discounted advertising rates, courtesy listings and the opportunity to be featured in the publication. It is also mailed to all Chamber members outside of our service zip code (46301 and 46304). 13,000 copies are distributed quarterly. Copies are also available in key businesses and public areas throughout the Chamber service area. 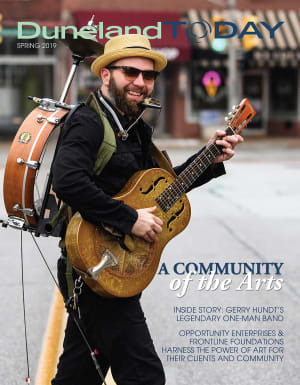 Each issue will contain editorial content showcasing randomly selected member businesses, articles of interest to area residents, and information on new members and member anniversaries. The publication is included in the Welcome bags and distributed at the European Market. Custom sponsorship packages are created to provide optimum exposure within the events and programs to each member. Members can sponsor a range of events, or focus sponsor dollar on one specific Chamber program. Opportunities are endless, click here to contact us for more information. Every Thursday members have the opportunity to provide a single flyer (high-res jpg preferred) to be emailed out. This opportunity is $90 per week the member is featured. Click here for rate sheet. Also when joining the Chamber, members may signify whether they'd like to be a part of the Gift Certificate Program. If so, you will be listed on our list of participants when individuals purchase Chamber Gift Cards. Once gift cards are redeemed at your place of business, you will be reimbursed in the form of a check from the Chamber. Chamber members are encouraged to reach out to other members with events, services, and specials. The Chamber will provide mailing labels or an electronic version of our database of the addresses of our members for strictly member use. Each new member receives this opportunity the first time free, and all members may utilize this service for a nominal fee of $25.00. The electronic database is completely free for all Chamber members. The site has many advertising opportunities like the Chamber Spotlight and event listings available to members. Click here for rate sheet. Welcome Bags are given to new residents. This is a great way to introduce you to new residents by offering items such as calendars, pens, magnets, note pads etc. Please notify Michelle Hunsley at michelle@dunelandchamber.org if you wish to participate in our "Welcome to Duneland" program.